Because trauma patients admitted to an ICU have a significant mortality risk (15–20%), and families have consequent, immediate psychosocial needs, the intervention was designed to apply to all trauma patients and their families regardless of their prognosis. Because of the nature of trauma, its sudden onset and rapid trajectory from well to life-threatening illness, the intervention was designed to begin at admission to the ICU, with early communication and family support. The program consisted of five clinical steps grouped into parts I and II in a timed sequence from admission.... In part I, within 24 hours of admission, each patient had a palliative care assessment by physician and nurse. Each family received psychosocial or bereavement support. The palliative care assessment encompassed prognosis, advance directives, family support, and surrogate decision maker, and pain and symptoms. To assess prognosis, physician and nurse were asked the most likely outcome using a score 1-5 similar to the Glasgow Outcome Score, with 1 = death and 5 = independent functional recovery. In part II, within 72 hours, an interdisciplinary family meeting was held regardless of prognosis; during the meeting, likely outcomes, treatments, and goals of care were discussed. These meetings were assessed subjectively by counselors for discussion of goals of care, family understanding of information, and conflict. When the goals of care transitioned from curative to a completely palliative approach, a palliative care order set was implemented. This paper compares aspects of care between the ~280 admissions in the baseline year with the ~370 in the year after implementation. About 70% of patients completed both steps 1 and 2 of the program. Many outcomes didn't change: total mortality was the same in both years (15%); rates of DNR orders (~43%) and family meetings were similar (~60%) as was the timing of family meetings (nearly all within 72 hours of admission). What did change were: rates of withdrawal of life-prolonging treatments were higher after the program started (37% of deaths vs 24% - again, however, overall mortality was the same); timing of DNR orders and withdrawals of life prolonging treatment were earlier; overall length of stay in the ICU and hospital was shorter in those patients who died after the program was implemented (mean hospital stay went from 14 days to 6.5 days in those who died). Essentially, then, what this intervention did was accelerate the decision-making process between families and ICU staff about transition care goals to comfort in a dying patient - and this happened without any demonstrable effect on overall mortality. What's really interesting here is that even before the intervention this ICU team were having early family meetings at a high rate, suggesting that these were not responsible for the changes in care. Instead one wonders if it was the rapid and structured identification of patients very likely to die along with immediate opening of discussions about prognosis and patient/family values/goals. That, and a general culture shift that attended this formalization of 'palliative care' principles into the care of this population (for instance, the discussion notes that this group also introduced end of life peer review into their morbidity and mortality conference). Thorax has a randomized, placebo controlled trial of inhaled furosemide for dyspnea in patients with COPD. Specifically, it was a randomized, double-blind, placebo controlled cross-over trial of inhaled furosemide in 20 patients with moderate to severe COPD. Subjects (mean age 61 years; mean FEV1 45% of predicted) were given inhaled furosemide or placebo on two different days and then a bunch of tests were performed (spirometry, exercise capacity using a cycle ergometer, etc.) about 30 minutes after the treatment. The specific treatment was inhalation of a 4 ml solution containing 40mg of furosemide (10mg/ml) or saline placebo, nebulized over 15 minutes. Results: there were minimal differences in spirometry findings between groups. Those receiving furosemide had some statistically significant but modest improvements in exercise capacity (could tolerate an extra ~1.5 minutes of exertion) and exertional dyspnea (~1 point on a 10 point scale). They performed several subgroup analyses: essentially there were no clear-cut predictors of who responded. Of note, there were 7 patients whose dyspnea improved with furosemide but whose exercise capacity didn't. The authors discuss the multitude of hypotheses as to why inhaled furosemide could be effective. My gloss on this is that this is some supporting data for further studies, but it is not compelling evidence for adopting this, particularly in a 'palliative care' COPD population. The outcomes looked at here were exertional dyspnea under controlled conditions within a very short time-frame of receiving a single treatment - and the magnitude of the treatment effects was not great. This is not dyspnea at rest or a clinical setting which resembles real life. I know inhaled furosemide for refractory dyspnea has been discussed anecdotally in the palliative care literature: anyone out there using it or know of other research supporting its use, particularly in refractory/rest dyspnea (from COPD or other causes)? Archives of Internal Medicine has a literature review and discussion on relationship building and good communication skills, with a focus on what can be done in brief patient encounters. (It has a specific primary care focus.) To be sure, the literature is sparse, and this paper mostly discusses it in a narrative fashion, making some common-sense recommendations. I'm noting it because, as an educator, I'm constantly telling my residents/fellows/etc. that good communication does not necessarily mean a huge time commitment (and certainly, anecdotally, it can be a huge time saver - I believe this even though I have nothing to back it up), and so it's good to see a paper specifically addressing the time-issues involved in patient-centered communication. Journal of Pharmacy Practice has a review article on symptom management of non-motor symptoms in Parkinson's disease (GI symptoms, psychosis, pain, dysautonomias, etc.). JNCI has a commentary warning about the over-selling of epidemiological findings in cancer research. That is - findings that suggest X 'is associated with' Y, even though there is no experimental evidence to suggest there is a causal link (e.g. coffee consumption is associated with lower risk for liver cancer - findings like that). The article is mostly a critical overview of how, why, and when such associations turn out to be 'wrong' (not causal) and is a good one for the EBM teaching file. The topic is important for a variety of reasons, not least because our patients read sensationalistic (or at least over-sold, uncritical) accounts of these findings and they can create false hope or 'false-guilt' (I caused my cancer because I didn't do enough aerobic exercise, etc.). The Oncology article is a fairly wide-ranging piece that begins by addressing what is meant by “futile care.” The authors point out that there is no common or consensus definition [I imagine that at least some of this is one of those “I know it when I see it” phenomena]. A recurring theme in this paper is discordance of perceptions and perspectives between patient and physician. Expert panels struggling over guidelines, a physician facing a desperate or resolute patient, children not willing to contemplate “giving up” on Mom, a patient with a religious belief that “everything” must be done, third-party payers—whether private or government, and John Q. Public (i.e., “society”) in the grip of a compelling drama may have varying and conflicting perspectives. The authors quote a 1993 article in which the reader is advised to distinguish an effect from a benefit. That dovetails nicely with an observation later in the paper that some patients overestimate prognosis because they confuse response with cure. There are several interesting tidbits provided that may be helpful to both experienced clinicians and to students or junior clinicians who are trying to get their heads around the issues related to futility dilemmas. Another study showed only a 25% concordance between what patients said their decision-control preferences were and the provider’s perception of the preference. One-quarter of physicians will occasionally administer futile chemotherapy to maintain patient hope. The median length of hospice stay is no longer lengthening, but getting shorter (down to 26 days in 2005 vs 29 days in 1995); one-third enroll in the last week of life and 10% on the last day. Equally valuable as the main article, the reviews provide valuable nuance and perspective. One practical idea is the "differential diagnosis" of a patient request that the oncologist thinks is not in the patient's best interest. What underlies the request--unrealistic expectations? Fear of abandonment? Present hospice as a treatment [reminiscent of Andy Billings' statement that family meeting is one of palliative care's most important procedures]. "A 20-60 minute conversation between an oncologist and a patient . . . is miniscule when weighed against a lifetime of family values, traditions, culturally held beliefs, and deeply entrenched religious beliefs." Randy Pausch, the famous professor who was diagnosed with pancreatic cancer last year died today at the age of 47. (I had blogged about him on Pallimed here and here.) His initial foray into the public eye was from his 'Last Lecture' at Carnegie Mellon being posted on You Tube and getting over 3 million views on how to 'Achieve your Childhood Dreams.' This popularity led to a wonderful and inspiring book and his further advocacy for pancreatic cancer research. He is a great example of how even in the face of death, meaning can still be found, and contributions can still be made. One of my favorite parts of the book is when he relates a story about a football coach who was particularly hard on him in drills as a child. An assistant coach inquired about how Randy felt about the coach riding him. He replied he didn't care for it too much. The assistant coach shared that it actually was a good thing because when he stopped critiquing you it meant he had already given up on you. I think this is a great inspiration for timely feedback in medical education. If you don't give it, have you already given up on the trainee who needs support and teaching? If you have read the book, please feel free to share a part that resonated with you. ABC has been featuring residents from Johns Hopkins University on the reality docudrama "Hopkins" on Thursday nights. The show goes to where the action is by focusing on the emergency department, surgeons, and pediatric ICU. Overall the show manages to capture life as a resident pretty well even following the difficulties outside the hospital for one of the physicians going through a divorce. I had high expectations of palliative medicine being featured during the show given that over 6 hours there would likely be some end-of-life issues cropping up. But after 4 episodes the demonstration of palliative care skills has been mixed. Have any Pallimed readers been watching this show? I am curious to how some of you responded to a pediatric intensivist* who suggested to "just let the child die" during a informal doctors conference about a toddler with a dilated cardiomyopathy who had a cardiac arrest during anesthesia induction about to be put on ECMO? You can watch it yourself...EPISODE 4 available online; move to a little less than a quarter of the way through the episode. You have been warned by the way, seeing the child unresponsive and actually coding was very difficult to watch for me even being through lots of codes and seeing deceased, lifeless patients. PICU Attending #1: We don't know hom much damage has been done. And there is some disagreement as to whether we can save the heart or not. PICU Attending#2: It is my opinion that we just let the child die. ECMO would be a bad idea. But I suspect that I am in the minority. #1: Why would you say that? We don't have the biopsy back yet. If the biopsy shows that he has acute myocarditis...then we could...uh..ride him thruough this storm. Now if it shows that he has got..uh you know scar there..well..yeah...then we got a problem. #2: What do you think the biopsy is going to show? #1: I agree that this is likely to be old. "let him deteriorate and provide palliative care or attempt a risky heart transplant if one becomes available." But they never actually talk about palliative care on the show. Can someone else remember where they said 'palliative care?' I can hear those words in the media from a thousand paces. I think it is important to realize this scene and the doctor's words got a lot of outrage on the Hopkins/ABC website in the Episode 4 Talk Back Q& A section. People are calling for his firing, and saying he should not be a doctor. The child eventually made it through the situation causing more outrage on the message boards. And further anecdotal evidence for the public that 'doctors can be very wrong.' To me this scene is part of the frank discussions physicians may have every day, especially doctors in the ICU. Sometimes opposing views need to be heard even though they may be unpopular to make sure there is justification for the current plan of action. The attending even pointed that out by acknowledging his 'minority' view point. While palliative medicine as a specialty is lacking on the TV show (Hopkins surprisingly does not have a palliative medicine fellowship), the Hopkins/ABC website has video responses from Dr. Holly Yang from San Diego Hospice about different situations in each episode that could have been approached in a different way. You sometimes might have to scroll through the responses to find Dr. Yang. Too bad they had some audio difficulties with some of her segments. Hopefully we may run across good examples of palliative care in the last two episodes this Thursday night and next Thursday night on ABC. Check your local listings. (There I have finally said it. Now I need to cross off "Stop the Presses!") All the episodes are also viewable online and on Itunes. We may have to do a code count for the show to see how they portray CPR. Any volunteers? * One commenter dubbed him a "insensivist" I got to remember that one. Dr. Anna Pou, the doctor who was accused of murdering patients during the aftermath of Hurricane Katrina gave a rare interview covering her experiences and discussing a new law to cover medical personnel who assist in a disaster. The grand jury and attorney general eventually dropped the charges but she still faces two civil suits. When nightfall came, the hospital and the city were in darkness. Water pressure dropped, toilets backed up and the temperatures began to swelter. "The smell got to be rancid in no time," Pou said. "It burned the back of your throat." Pou said staff struggled to climb stairwells, carry supplies, and spent two-hour shifts squeezing ventilators to keep patients alive. "The heat was so terrible, it wore you down," Pou said. "We were trying to keep the patients comfortable. The 9-year-old daughter of one of the nurses even took shifts fanning them." "I felt very alone," Pou said of her year of fighting the criminal accusations. "Even if people were around me I felt an intense loneliness. It was as if no one knew what I was going through." My apologies to the email readers who got a screen full of flags for the last post on International Hastened Death Review. The original images were large when uploaded and shrunk within the Blogger program, but apparently that did not get translated to the email feed. So you got your whole screen filled with the Australian, Canadian, and other flags with a little bit of text scrunched in between. The error has been noted and the Pallimed writers informed of how to avoid this in the future. This article describes people obtaining the medication without a doctor's prescription, therefore 'physician-assisted' is a disqualified descriptive. They merely need to show a picture of the medication they want at the Mexican veterinary stores. So I guess this is simply 'suicide?' Although I think 'suicide' is too broad to define the particulars about a situation where someone is in the terminal phase of a condition versus someone suffering from a severe depression but no terminal illness. But to label this 'terminal suicide', 'hastened death in the terminal phase' or some other contortion feels clumsy and is bound to cause even more confusion. Regardless of the term used, the issue has been made more relevant with a couple high profile cases of medicine and hastened death. In Australia, Exit International and Philip Nitschke have been making the papers and TV (and are featured in the NYT article) with a public campaign to legalize euthanasia including You Tube Videos, film screenings, book promotions (attempts at banning it are underway in Australia and New Zealand), workshops and political initiatives. More focus has been on Mr. Nitschke and his group since the recent manslaughter conviction of a woman who gave a barbiturate to her partner who had Alzheimer's. Another recent case is also being featured of a woman who was depressed but not terminally ill who supposedly relied on information form Exit International's materials to kill herself. In Germany, a lawyer/politician advised, and videotaped a 79 year old woman who prepared and self-administered a 'lethal cocktail.' The woman was not terminally ill but chose hastened death because she did not want to go to a nursing home. The politician, Roger Kusch, was inspired by Dignitas, a pro-euthanasia organization based in Switzerland who has many people from Germany requesting its services. In Scotland, a Member of Scottish Parliament, Margo MacDonald has filmed a documentary with the BBC and proposed legislation to adopt the euthanasia and assisted suicide laws similar to The Netherlands. In Italy, a case eerily similar to Terri Schiavo and Nancy Cruzan is being discussed publicly and was recently covered in TIME magazine. A 20-year old woman in a car accident (in 1992) now comatose and with a feeding tube that her father wants to have removed (and has fought for since 1999) was allowed by Italian courts to stop her artificial nutrition via feeding tube despite much opposition. The case is now pending appeal despite already having gone to the Italian Supreme Court in 2002. In Canada, Samuel Golubchuk, an 84 year old man whose family fought hard to continue aggressive life-prolonging measures died 9 months after doctors initiated discussions about end-of-life decisions. He died on full life support measures. If his life support was withdrawn it would have been illegal since a court ordered physicians and the hospital to continue partly based on the family's belief of hastening his death would be a sin under Orthodox Jewish law. The case was to be heard by a full court in September. Doctors refused to care for him, likening his medical treatment to 'torture.' In England, a man who was refused Sutent, a prostate cancer drug, by the National Health Service suffocated himself. So why is this all important to palliative care? and they may never bring it up with you for a multitude of reasons. Or they may hint at hastened death, but never start an open discussion. Or they may make a sly joke about it, waiting to see how you respond. Or they may assume what is good standard palliative care is really euthanasia. Good hospice and palliative care practices can help people discover hastened death does not have to be the easy way out. If the lines are too blurred between the legal and illegal our field has significant trust to lose with the public and our peers. Being educated and aware of the public debate over hastened death is a responsibility for palliative medicine to ensure the safe, ethical, and legal care of the patients and families entrusted to us. Chest has an article about the effects of treatment limitations in ICU patients on prolonged survival. I'm not going to discuss the article itself much: it's also well discussed in the July 2008 PC-FACS (although you have to be an AAHPM member to access it) and in an accompanying editorial in Chest. Instead I wanted to focus on its use of propensity scores, as the article is a good introduction to them. Some background on the article. It's a single institution retrospective cohort study which compared 60 day mortality between patients for whom there was some sort of order/decision to withhold a life-sustaining treatment in the ICU (e.g. vent, dialysis, pressors, CPR, etc.) and patients who had no such decision/order. Patients who had any such treatment withdrawn were excluded, as well as patients who wanted comfort-only care. There were ~2000 patients in the study; ~200 had a WLST decision. As you'd expect, the WLST patients were older, sicker, with a higher in-ICU and in-hospital mortality than the non-WLST patients (16% vs 2%, 30% vs 5%). The authors then created a propensity score model to describe the likelihood of having a WLST decision. Propensity scores (PS) are a way to try to minimize confounding differences between groups in observational research. Clearly one cannot do a RCT of WLST decisions. Instead all you can do is watch what happens to those who have a WLST decision and those that don't. Of course there are likely many confounding variables in such observations (things that are associated both with having a WLST decision and with death like being older and sicker - it's not fair, say, to compare these older, sicker patients with the younger, healthier ones and conclude that the WLST decision was responsible for increased mortality). What PS try to do is to mimic a RCT by creating a model which predicts the likelihood of a subject getting an intervention (in this case WLST) then comparing outcomes between subjects who got the intervention or not but who had an equal chance of getting the intervention in the first place (i.e. as if they were randomized to the intervention or a control). To clarify.... A multivariate model is created from as many data points (hopefully) that the researchers have. This model creates a score (PS) which describes a patient's likelihood - within the cohort - of receiving the intervention (in this case a WLST decision). In this paper it was a 69-variable model and included things like demographics, markers of illness severity, etc. - the model was derived from data from the subjects in this cohort, and, again, predicts a subject's likelihood (propensity) of getting the intervention in question. A simplified example could be: a 67 year old white male with Medicare admitted to the ICU on hospital day 4 with an APACHE II score of 30 and gram negative sepsis would have a PS of X. X being some number which means something to statisticians about how likely this patient is to have a WLST decision in this cohort. (A 53 yo woman with diabetic ketoacidosis and an APACHE II score of 14 would have a lower PS, for instance.) What you then do is take a patient with a WLST decision, derive their PS, then match them as closely as possible to a patient in your cohort who did not have a WLST decision but who has a nearly identical PS. The idea is, again, to mimic a RCT in the sense that - as much as your model is accurate - both of these patients had an identical 'chance' or 'risk' of having a WLST decision and it 'just so happens' that one did and one didn't; you then can fairly compare outcomes. You repeat this matching across your entire sample of WLST patients and you can then compare outcomes between the groups because, ideally, the patients in the WLST group and the non-WLST group had an equal 'chance' of receiving that 'intervention' and so it's fair to then compare the outcomes. The obvious problem with PS is that it all hinges on what is included in the multivariate analysis to derive the PS. Only things which are measured can be included, and so if there are important factors which aren't being measured or included, which could influence the outcome, the model breaks down. (For this study the editorialists points out that in this study clinicians' prediction of prognosis was not included). Why am I rambling on about PS? They have been proposed and promoted within the palliative care research community as one 'get around' for the fact that controlled trials are often impossible or impractical for our patient population (like for instance this trial, or one looking at the effects of G-tube feedings in dementia, or the effects of early palliative care consultation on some outcome, etc. ), and PS have some appeal because they approximate randomization (again, only as well as the models contain all relevant variables, which is a significant issue). They have been discussed in J Palliative Med here, and were the subject of a concurrent session at AAHPM last winter, and I've begun to see them used more often. I have been waiting for a good article to introduce into my program's palliative care-EBM curriculum about PS and this is the one I'm probably going to use (as it's relatively easy to understand and a little controversial which gets people excited and interested). PS are not without controversy, not only because of the issues mentioned above, but there's some debate whether they actually add anything to 'routine' multivariate analysis; however this debate is quite statistical and well above my head. I haven't found any really good, simple (casually readable) summaries on PS: this one is OK.
European Journal of Pain has a review of transdermal buprenorphine for pain. It's an interesting article and makes some dizzyingly impressive claims on behalf of the drug, which I note below. Buprenorphine is a partial mu-opioid agonist and a kappa-opioid receptor antagonist. The article states that despite being a partial agonist no ceiling effect of analgesia has been observed in humans, and that it acts like a full mu agonist when used at 'analgesic doses.' On the other hand they present data that there is a ceiling effect to buprenorphine's respiratory depression effects (meaning that it's theoretically safer than other opioids regarding that toxicity; they note that dangerous respiratory depression is nearly unheard of with buprenorphine unless other CNS depressing drugs are being used). The article notes that buprenorphine not only does not induce mu-opioid receptor internalization (one of the mechanisms for opioid tolerance seen in other opioids) but that it actually increased cell surface density of mu-receptors, which may be an explanation for the impression that less analgesic tolerance is seen with buprenorphine than other opioids. It has an anti-hyperalgesic effect (as opposed to the hyperalgesic effects seen with other opioids). It has been demonstrated to have fewer side effects in head to head studies with morphine. It can be taken safely with other opioids with additive analgesic effects. In placebo controlled trials rates of nausea, dizziness, and tiredness were no worse with TD buprenorphine than with placebo. It's less constipating than morphine or fentanyl. At least one patch formulation can be cut to decrease the dose. It's had decent studies in both cancer and non-cancer pain. Theoretically people are less likely to have problems with psychologic dependence on it. Whew. Reading this article leaves one with the feeling that TD buprenorphine is (in the parlance of my former residency program) liquid Jesus (i.e. good for just about pretty much anything - we would use it to describe drugs like aztreonam, etc.). Let's see: better analgesic with less side effects/tolerance/hyperalgesia which is nearly impossible to OD on? It seems almost too good to be true (there is no mention of who sponsored the article) and I sat here reading this saying to myself if all of this is true then why hasn't this revolutionized opioid pain management and why hasn't TD buprenorphine become the opioid of choice for chronic pain? It raises the skeptic bug in me, but perhaps this is simply because we're behind the times here in the US. Transdermal buprenorphine is not available in the US (or Canada? ), but sublingual buprenorphine is (it's approved for opioid maintence therapy in opioid dependent patients). I'm told that one can prescribe it for pain without a special license however I'm not entirely sure if that's true (this seems to contradict what I was told). My questions are: 1) is anyone using this or seen sublingual buprenorphine used for pain in the US, 2) does anyone know if transdermal or sublingual buprenorphine are being evaluated for approval (for pain treatment) in the US?, and 3) are any of our European readers using this and if so is it good as this article tells us? medication); problem-solving treatment to teach the patients coping strategies designed to overcome feelings of helplessness; and communication about management of major depressive disorder with each patient's oncologist and primary-care doctor. The primary outcome was a depression score at 3 months (they used the SCL-20 depression scale; grossly it's a 0-4 composite score from a 20-item scale with 4 being the worst and 0 being zero depressive symptoms). Depression scores decreased for both groups at 3 months (from a mean of 2.3 to 1.2 in the treatment group and 1.55 in the control group - this was statistically signficant). Many econdary outcomes were improved in the treatment group as well (68% of intervention group patients no longer met DSMIV criteria for major depressive disorder vs. 45% of control patients at 3 months, etc.). One might note that these rates of 'therapeutic' drug doses are identical to the remission rate as defined by the DSM structured clinical interview criteria and wonder if the effect of this intervention was really pharmacologic (via encouraging the patients to talk with their docs about depression and be more open to pharmacologic therapy). To be clear, that was, in fact the point of the educational intervention and it appears it worked, albeit only modestly better than usual care. There are three major problems with interpreting these sorts of trials. First, it's always impossible to get a good sense of what the actual intervention was (what it entailed, could this be something that's feasible at my center, etc.). Second, for these complex non-pharmacologic interventions one always wonders if there was some simple aspect of the intervention which actually lead to its salutary effect (i.e. something which would take 5 minutes once not 45 minutes 7 times) - there's no good way of knowing without more trials etc. etc. That is - despite its welcome findings as a clinician there's an off-putting-ness (forgive me for that hyphenated monstrosity) about it - 'sounds nice but I'm not convinced this whole thing is worth it and it seems too complex to really consider something like this). Third, as this is a constant issue with palliative-care-relevant (it strikes again) research, it necessarily involves scales and indices and numbers and as much as I'd like to know what the patient-relevant difference between 1.2 and 1.55 on the SCL-20 at 3 months is I don't. There is no way for the average clinician to appreciate what that means in our patients' lives (like we could, for instance, by knowing that the number needed to treat to gain a 50% reduction in pain at one month is 3 for drug X - and even some would argue we don't know what that means...). Anyway, despite the above, it's great to see such well-designed research into treating depression in the setting of cancer, and I hope there's more to come. My own gloss on this is that it likely worked because it improved patients' 'access' to antidepressants; drugs which many patients, even those suffering greatly with depression, are reluctant to try. wondered. Was there a therapy somewhere that could help Marni Adams? Cancer has a paper about patient expectations and how they relate to chemotherapy related nausea. The data come from a multi-center trial comparing several anti-nausea regimens. This analysis looked at ~670 first-time chemotherapy patients who were all asked at baseline how likely they thought they'd have nausea, and how severe they thought it would be. After chemotherapy patients kept a nausea log (per the treatment trial protocol). Patients who were most expectant of severe nausea did, in fact, have worse nausea (worse average and worse peak nausea) than the other patients (those who had no nausea or a 'moderate' expectation of nausea had similar rates). Vomiting was not measured as far as I can tell. A few thoughts about this.... It's possible from this study that patients who expected the worst were also more likely to give higher nausea scores than patients who didn't (that is - they were more likely to give higher nausea scores no matter what due to some underlying characteristic - this is akin to acknowledging that one group's 7/10 pain may be different from a 2nd group's 7/10 pain). I'm not sure you could get around this by measuring vomiting although it would have been interesting if nausea scores were different but vomiting episodes were the same. Not that nausea alone isn't dreadful. One interpretation here of course is that expectation indeed does correlate with symptoms. If this is so, you could argue that clinicians should therapeutically minimize the possibility of nausea when discussing chemo with patients. A similar approach has been proposed with procedural pain: I can't remember the reference but there have been findings that the more clinicians say things like 'this is going to hurt....' the more patients, in fact, hurt. Shutting up during procedures has been proposed as a superior technique based on these findings. Pain Medicine has a practical, chatty case series plus clinical pearls piece about pain management in hospitalized patients with dementia. It's a good one for the teaching file and highlights many issues I imagine many of us see: patients can't ask for pain meds so never get them; patients placed on PCAs who can't understand what they are; patients unable to report side effects of or response to pain medications. Some practical advice is given. Of course no miracles here. It does highlight the absolute importance of having well-trained nurses to monitor the patients, use PRNs wisely, record pain responses, etc. Palliative Care Nurse: "We got a new consult in the ICU. A 55 year old who has been on the vent for 4 weeks with platelets of 75, on levophed and hemodialysis." Palliative Care Doctor: "Sounds pretty serious. I wonder how he is going to do?" Have you ever faced this dilemma of prognostication? If so, there is a new prognostic test developed for just this situation. If you are asking yourself, "Where is the prognostic dilemma? I already have a pretty good idea of what is going to happen" then you can go to the head of the class. A reader sent me a well-executed study demonstrating the development and validation of a prognostic scoring system. This NIH funded study from UNC, Duke, and ECU was completed over 4 years (3 for the development cohort of 200 patients and 1 for the validation cohort of 100 patients). Do you find this score to be clinically relevant? Would you use it to inform your decisions/prognostic estimates? Would you quote it to the family or patient? How about discussing with other clinicians? Personally, I am not too sure it is clinically relevant. We rarely see patients on vents longer than 21d still in the hospital. They are often already at the long term acute care hospital. I plan to give it a try and see how it compares with my own clinical judgement and that of my peers. "Simple clinical variables measured on day 21 of mechanical ventilation can identify patients at highest and lowest risk of death from prolonged ventialtion." If you have a ProVent score of 2 or more you have minimal chances at being alive and independent in all ADL's at one year. Obtain clinician estimates for survival as a measure to compare your calculated prognostic score. Otherwise you risk making a score that is no better than current practice (communicated or not). Condeming all clinical estimates of survival based on a small handful of poorly designed studies does not qualify statements like "we know that prediction of mortality by clinicians using clinical probability of ICU survival is not accurate." We have too much to learn about the practice of clinical prognostication to come to this conclusion. Inclusion of the prognostic score is vital as a core part of the research to be examined and discussed amongst peers. Clinically relevant prognostic time frames are important and are very situation dependent. Discussing the chance that someone may have a 90% chance of dying within 1 year or even 3 months is not typically being discussed in ICU palliative care family meetings. The range may be hours, days or maybe a couple of weeks. Include palliative care consultation and decisions to withdraw or withhold key life support measures as baseline demographic or outcome variables. These two issues could have major repercussions on validity of data sets concerning mortality. Consider using the ProVent score to stratify different risk groups in this select patient population. The New York Times published an article on nurses being attacked on the job. 12x the rate of violent injuries compared to the rest of the private work force! I know many nurses could share stories about being a victim on the job. In March there was even a murder of an ICU nurse in the ICU as a retaliation by a son for the death of his mother. Sadly it was a case of mistaken identity. What implications it has for those who deal with dying patients all day no one has ever commented. A team blog called Mothers In Medicine had a highly commented post on crying in medicine. They had another good post this week on being the child of a doctor. With a good follow-up post from a commenter. The WSJ highlights the financial obligations oncologists are going through to obtain expensive (100k/year) meds for their patients. Surprise, now cost is being discussed upfront with patients! Jennifer Bunn, RN blogs about a BMC article (open access) on how health care workers would respond during a pandemic. Think about if your city was flooded, or had a aggressive contagious deadly virus, or had a biohazard catastrophe? What would you do? JAMA has an opinion article about being stalked online by patients (sub required). You may not think you have an online footprint, but try Googling yourself and see what you get. And no I am not the director of Middle Eastern studies for the School for International Training in Vermont. Three recent methadone-related reviews, two by the same group, are well worth the reading. The first two, on conversion ratios and drug-drug interactions, respectively, are the long-awaited published versions of presentations made at the AAHPM/HPNA conference in Salt Lake City in 2007. They are among the most thorough and well-organized reviews on any topic that I have read in recent years. The third is a consensus guideline on parenteral methadone in palliative care. The authors reviewed clinical trials, retrospective analyses, case reports, and case series published from 1996 to 2006; reviews were excluded. A total of 41 papers (22 studies, 19 case reports; N = 730) were reviewed. None of the studies were deemed to be of high value. Not surprisingly, they identified the heterogeneity of studies as the biggest challenge in their analysis. Not only were different methods and populations used, as well as different descriptive statistics and outcome definitions, but different conversion values and tables for non-methadone opioids were used. While most suggested conversion procedures recommend converting all opioids to morphine equivalents, some use oral equivalents and some use parenteral equivalents. Rather than just throwing up their hands in frustration, the authors recalculated many of the formulas presented, using consistent values. It should be well known by now that there is not a simple ratio of morphine to methadone that works at all dose levels. Most studies stratified patients according to the pre-rotation morphine-equivalent dose because of the “dynamic inverse potency relationship between methadone and other opioids.” The most common ratios reported were 4:1 and 10:1; the review authors estimate that 30% of all patients were converted using one of these ratios. However, the reported range was 4:1 to 37.5:1. Using scatter plots, the authors sought to determine the correlation between prerotation morphine dose and the morphine: methadone ratio. They identify a “strong, positive linear relationship between the prerotation morphine dose and the postrotation methadone dose,” but the dose ratio is not constant in relation to the previous morphine dose. When attempting to apply these findings to individual patients, there is confounding due to large interindividual pharmacokinetics with methadone. They emphasize that the “care process” or conversion procedure as well as the calculation of dose ratios varies considerably across studies. “It may be less important to determine an exact opioid ratio . . . than to be sure that the patient is an appropriate candidate for methadone rotation, the switch is carried out over a time period consistent with the therapeutic goals, and that the patient is monitored closely by medical staff throughout the process.” They note that there is no consensus regarding the various published methods of conversion, but that the majority of patients are successfully rotated in all settings regardless of method employed and ratio used. There is also acknowledgement that conversion ratios are not bidirectional and that there is almost no guidance in the literature for conversion from methadone to another opioid. Finally, there is a long discussion of the deficits in the research literature and suggestions for the future direction of research. I’m not sure that anyone already experienced in methadone conversions will change his/her clinical practice because of this paper, but it may well provide rationales for teaching and encouragement for reseach. The consensus panel are almost all very well-known pain and/or palliative care clinicians. They review the very limited literature specific to parenteral methadone, then suggest clinical approaches to optimize it’s use. The paper includes a pretty extensive discussion of the implications for QTc interval changes and the risk of torsades de pointes. This paper doesn’t compare in thoroughness to the other two, but it is a useful review and probably unique in its focus specifically on parenteral methadone. Shaiova L, Berger A, Blinderman CD, Bruera E, Davis MP, Derby S, Inturrisi C, Kalman J, Mehta D, Pappagallo M, Perlov E. Consensus guideline on parenteral methadone use in pain and palliative care. 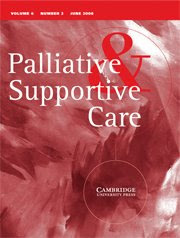 Palliat Support Care. 2008 Jun;6(2):165-76. Annals of Internal Medicine has a discussion of surrogate-decision making that echoes (in a much more organized and erudite way) some of the murmurings we've made on the blog before about surrogacy, advance directives, etc. Nevertheless, research suggests that patients, surrogates, and even their physicians often operate independently of these standards. For example, despite the formal recognition of the primacy of patients' stated wishes, there is growing awareness that patients do not value or even define personal autonomy uniformly. Moreover, many patients do not necessarily want their surrogates to adhere to their specific treatment preferences or to follow the standards in sequence, but instead wish them to respond dynamically to actual clinical situations in order to maximize their evolving, contemporaneous interests and to make judgments that integrate both medical and nonmedical considerations. One nonmedical consideration, for example, is that many patients consider placing trust in their surrogates more important than assuring their surrogates' ability to accurately predict the patient's own decisions. Some patients modify their preferences to accommodate their family members' concerns, and some give weight to the distress they anticipate their family will experience from unavoidable choices. The 'alternative' model here being one of people caring about a process of decision-making (placing trust in a loved one, etc.) rather than pre-ordaining what those decisions should be. For example, the statement "I never want to be fed through tubes" made by a now-incapacitated patient would require an interpretation of the phrase "to be fed." Did the patient mean only ongoing and indefinite support, or time-limited or goal-directed nutritional support as well? Ostensibly clear wishes that, in fact, require interpretation are at a point on the continuum somewhere between known wishes and substituted judgments. For every patient I've met who's wishes were clearly consistent with a DNR/DNI order (and were full-code because no one had bothered to ask), there are ones whose families are struggling with their statements about 'not wanting any tubes' or 'not wishing to be hooked up to life support.' Did they mean never, under any circumstances? Or just when it would likely maintain them in a permanently incapacitated state, or prolong dying, or in some other way be non-restorative? Or patients who wrote (or checked the check-box on some forms) "I want cardiopulmonary resuscitation" or some similar variation. Always? Under all circumstances? When their physicians strongly believed it would not save their life and only prolong their death by a few ugly minutes or days? By writing that did they intend to communicate to families: "it is my intention that you ensure that I die ventilated with someone pushing on my chest no matter what"? Advance directives (as many of them exist) and even 'talking with your family' often can't fix these problems. Almost no one (...almost!) wants to be CPR'd to death, or to die on a vent, and these terrible decisions often come down to identifying when someone is 'really' dying, when these interventions are 'really' not going to help, to nurse families through the process of knowing when enough is enough so to speak. I.e. the real decision is not whether or not to perform CPR (or whatever) but whether or not the patient is 'dying' (or has reached some point of sufficient prognostic certainty and gravity). There are good ethical/legal and regulatory reasons to be sure to have named a proxy decision-maker or makers (i.e. formalize at least one part of that process mentioned above) as well as to 'officially' give those decision makers some sort of empowerment to say 'No' (particularly given the evolving situation in the US regarding what's required to stop artificial nutrition and hydration in some circumstances). There are some patients (although I'm convinced it's not many outside of those in the final months of life) who do genuinely wish to have straight-forward/no exceptions/no-question-about-it treatment limitations (the COPD patient who knows what it's like to be intubated and has decided never again no matter what, etc.) - documenting those wishes meticulously is obviously a good idea.